CruiseJobFinder also specializes in helping people find great yacht crew jobs on privately owned sailboats and luxury yachts. This can range from a 50-foot sailboat sailing through the Mediterranean to a mega yacht, owned by one of the world's richest individuals, which is sailing all over the globe. These types of jobs are a great alternative to working on a cruise ship and offer a truly unique experience. Imagine your days full of work where you will meet people from all over the world, travel to exotic destinations, eat gourmet meals with a private chef and feel the breeze of the ocean air right in your office. Seems a little far fetched right? Working as a crew member on a private yacht is all that and more. In our yacht crewing jobs section you'll learn all about the types of jobs available: is it best to work on a charter yacht, for a yacht captain or on a luxury yacht? Charter yachts take guests on a single or multi-day trip for a fee. Some of these yachts may be commercially owned by a large corporation while others are owned by private individuals who commonly act as captain. What about mega yachts such as those owned by Saudi princes and the billionaires of the world like Paul Allen, the Microsoft co-founder, and famous golfer Tiger Woods? 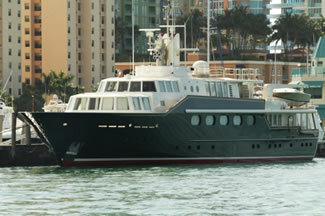 Mega Yachts, luxury yachts and superyachts are all yachts that are 78 feet or more. These vessels can cost from one million U.S. dollars or more. Finally, smaller yachts are much more affordable than they once were and more captains are buying their own yacht and pushing off anchor to explore the world on their own terms. No matter the size of the vessel a crew is necessary. Unlike the busy cruise lines, working on private yachts offers an opportunity to work with a small amount of guests and co workers. The intimate setting paints a pretty picture enabling crew members to bond closely with their fellow crew members, employers and guests that make take passage upon the yacht they work for. Yachting etiquette must be portrayed and a sense of adventure is a must! Learn more about yacht crewing jobs in our Members Section. Overview - A step-by-step job search strategy and advice for using CruiseJobFinder. Yacht Jobs: A Day in the Life - Working on a private yacht can peacefully sweep you away into another mentality that you may have never known could exist outside of the 9-5 confines. Work on a private yacht can be long hours and busy but the work is different than a long busy day at the office. Do you wear a uniform? What are the sleeping arrangements like? Yacht Crewing Options - The three primary options are crewing for a captain, on a luxury yacht, or charter yacht. Yacht Job Descriptions - Nearly a dozen different jobs described, from Captain and Mate to Chef and Steward. Safety Guidance for Yacht Crew Job Seekers - To be certain there is far more dangerous work than that which can be found on a yacht. Nevertheless, we tell you some things to watch out for. Health and Hygiene at Sea - There's no room for a 'slob' on a luxury yacht, that's for sure. Learn what's expected in terms of etiquette, health, and hygiene. Plus, seasickness remedies and health insurance recommendations. Sea Skills and Training - Whether your ambition is to become captain or steward on a yacht, licensing in some area of nautical life is bound to be a part of your job plans. Find out what your options are. Yacht Crew Resume Tips - At some point you're going to find yourself face to face with someone who's hiring for a yacht job. What kinds of questions will they ask? What is s/he looking for on your resume? We've got some thoughts on this topic and share those thoughts in our yacht jobs resume tips section. Working on Yachts: Marketing Your Skills - It will be important to identify which type of yacht you wish to work for before developing your applicant presentation package. A charter boat company may seek people with completely different skillsets than the hiring manager for a 100-foot luxury yacht preparing for a round-the-world voyage. Learn how to properly market your skillset for the type of job your're seeking. Seasonal Sailing Locations Worldwide - If you are actively going to go out and look for work the best time to plant yourself in a yachting community is in the spring and fall. Utlilize our worldwide calendar and yachting locations table to target your job search. Check out your potential worldwide sailing options right now! Luxury yachts, charter yachts, and captain-owned yachts are all types of yachts that exist in this industry. Each one of them offers an amazingly different pace of life away from office life or for that matter any other sea work available.